Toronto’s yearly calendar of events can be truly called international. The flavour of the events touches all the citizens who come to Toronto from the four corners of the world.It’s very exciting to be able to enjoy a field of events that covers all artistic areas and all ethnic backgrounds. Toronto stages some of the best events in Canada and viisitors come from all over the world to join its citizens in the enjoyment of exciting events that cover sports, music, food, parades, and out-of-the-ordinary joyful happenings. In June 2012, Toronto offers LUMINATO (June 8-17) where the best artists from Canada and the world fill the Toronto stage. There’s the Toronto DRAGON BOAT FESTIVAL (June 23-24) that allows the competitive spirit of participants to swiftly move through the waters of Lake Ontario to the thunderous applause of those watching lakeside. 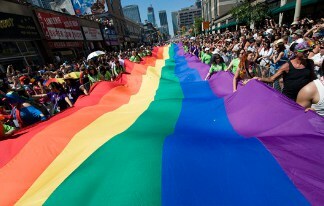 One of the main events of the summer is the PRIDE WEEK (June 22-July1) celebrations of the lifestyle of an important Toronto community, concluding with a giant Parade. For Jazz music lovers there’s the Toronto JAZZ FESTIVAL (June24-July 3) with some of the best Jazz musicians participating on the program. July is a very busy month for events, starting with the PRIDE PARADE and the CHIN PICNIC on Canada Day.For racing enthusiasts, the HONDA INDY (July 6, 7, 8) with devoted fans from all over North America following the race track side or on TV. The event is followed by the tribute to the Latino community with SALSA ON ST. CLAIR (July16-17) with a vast display of unique and tasty foods. Then comes the CARIBANA FESTIVAL (July 17-Aug 6) featuring possibly the most elaborate and beautiful costumes ever seen in a parade. 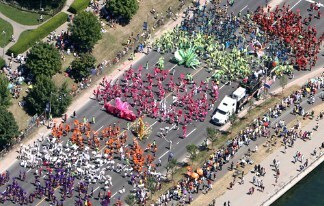 CARIBANA also provides hundreds of thousands of fans with a feast of many tasty foods as well as a feast for the eyes. August begins with the final 6 days of CARIBANA with many exciting party days. On August 19 we launch the largest of the Toronto food festivals with the TASTE OF THE DANFORTH. The festival features wonderful Greek food and music and is attended by well over a million people. 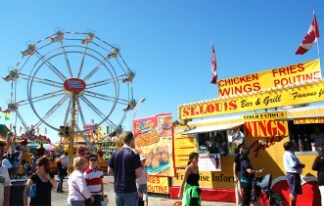 August Events reach a conclusion with the beginning of the CNE (Aug.17-Sept.3) also known as the CANADIAN NATIONAL EXHIBITION. This is an updated version of an old-fashioned farm fair with domestic animals, home grown food, top entertainment and carnival rides. It’s a “must see” for anyone living within 15,000 miles of Toronto, therefore anyone in the Western Hemisphere. As we get into September the final few days of the CNE is highlighted by the very popular NATIONAL AIR SHOW. For anyone interested in flight, this is a must see show. Next is what has been called the classiest film festival in the world – the TORONTO INTERNATIONAL FILM FESTIVAL (6-16) – eleven days of FANtastic viewing of many of the world’s great Stars and their movies. Look at them, talk to them, drink with them and enjoy their movies. This festival is a Fan based festival, where the Stars get to hobnob with the Fans. That’s why the Stars keep coming back. On September 29 we (sort of) close out the summer with NUITE BLANCHE an all-night party of very interesting artful happenings where more than 300,000 people wander the bars and streets of Toronto seeking out artistic creative endeavors by people from around the world. It’s a night of eye candy! Come even December and January, Toronto has a multitude of interesting events covering many categories – we’ve just highlighted the June to September ones for you. Whether you live in Toronto or planning a visit, we can assure you there is something happening every week of the year. WELCOME TO TORONTO! These events lend themselves to great promotional opportunities. Wild on Media’s Out of Home mediums offer an ideal means to reach the large audiences that attend. Our AERIAL ADVERTISING division offers a variety of unique aerial mediums including Airplane and Helicopter-towed Sky Signs and Sky Murals, individual and team Skywriting and our Helicopter mounted Digital Night Sign. The MOBILE ADVERTISING division includes one or more Mobile Scrolling Ad Trucks, Glass Cube Display Trucks, LED Day and Night Time Video, Sound and Bluetooth Trucks, Mobile Night Time Video Trucks, LED illuminated Walking Billboards, Adbikes and Street Teams. Laser and Wall Projections – which is the projection of full motion, static image or slide show advertising at night on the sides of buildings, are extremely dramatic and memorable. We hope to have more detailed information and videos of our Laser Wall Projection and LED Truck campaigns on our website soon. Meanwhile, please watch our Facebook Page and Youtube Channel, where they will appear first. Here are links to videos of previous clients using the above outdoor mediums. For more information on these mediums as well as information on other Wild on Media Out of Home mediums visit the “Mediums” section of our website.